(d) at θ = 60º, the block will start sliding down the plane and further increasing θ, it will topple at certain θ. The block will not slide down if the coefficient of friction μ is greater than tan θ. In other words, sliding begins only when θ becomes the angle of friction λ. Since μ = tan λ we have √3 = tan λ from which λ = 60º. So the block can start sliding down when θ = 60º. But the block can topple when the line of action of the weight Mg of the block passes through the edge A of the block (fig.). This can happen when tan θ = (AB/2) /(BC/2) = AB/BC = 10/15. Therefore, toppling occurs at an angle less than 45º (and greater than 30º). The correct option therefore is (b). Normally you may assume that the force is applied parallel to the inclined plane. (If the force can be applied without this restriction, the case becomes the most general one and the minimum force necessary to pull the mass up the inclined plane will be less than the value you will get if the force is applied parallel to the plane). The weight Mg of the mass M acts vertically downwards. 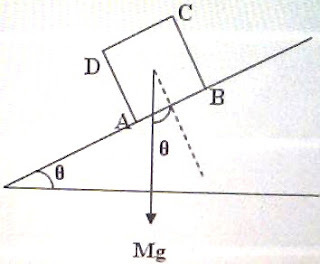 The components of this weight along the plane and normal to the plane are Mg sinθ and Mg cosθ respectively. The normal force exerted by the plane on the mass is Mg cos θ and the frictional force is μMg cos θ. When a force is applied to pull the mass up the plane, the frictional force will oppose the motion and will therefore act down the plane. The total force opposing the tendency of motion of the mass will be Mg sinθ + μMg cos θ. This is the the minimum force F necessary to pull the mass up the inclined plane. Substituting proper values, F = (1×10×sin 60º)+ (√3 ×1×10×cos 60º) = 5√3 +5√3 = 17.32 newton [Option (b)]. You can find all posts related to friction on this site by clicking on the label ‘friction’ below this post. Additional questions related to friction can be found here. Alternating current circuits were discussed on this site in the post dated 26th October 2006. You will find the post here. Since the voltages across L and C are of the same value, the circuit is at resonance and Lω = 1/Cω where ω is the angular frequency. Under resonance the voltage across the resistor is equal to the supply voltage. So the supply voltage is 10 V.
Po = η Pi = 0.9 ×4000 W = 3600 W.
Po = Io2R where R is the load resistance (or, the load impedence in this case). This gives R = Po /Io2 = 3600 /62 = 100 Ω. The impedance of an R-C circuit is √(R2 + 1/C2ω2). For large value of ω the value of Z1/Z2 tends to 1. For small value of ω the value of Z1/Z2 tends to 2. Therefore Z1/Z2 lies between 1 and 2. The area of the coil in the second case is 4A since the radius is doubled. But the number of turns will be N/2 in the second case since the length of the wire required for a turn is doubled. Or, 100 /V2 = ½ from which V2 = 200 volt.